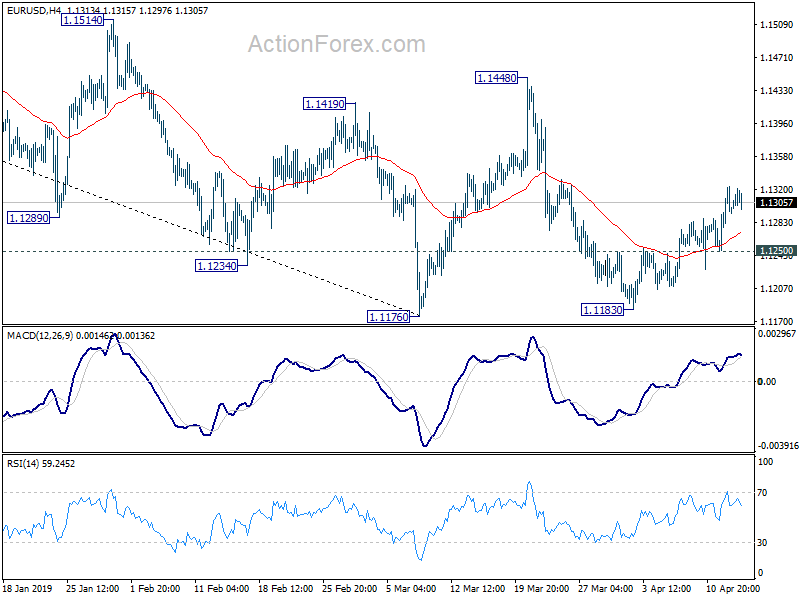 The forex markets turn relatively mixed today and markets lack a general direction. Risk appetite appeared to be firm earlier in Asian session but quickly faded. Major US indices open the day mildly lower. While German 10-year yield is trading up at the time of writing, US 10-year yield is trading down mildly. In the currency markets, Sterling is the strongest one for the moment but it’s still staying well inside recently established range. Canadian Dollar follows as the second strongest., then Euro. Swiss Franc is the weakest one, followed by Australian Dollar. Markets will need more inspiration from the upcoming economic data in the week. Technically, 112.13 resistance in USD/JPY remains a focus for the rest of the session. Break will confirm resumption of larger rally from 104.69. EUR/JPY is still on track to test equivalent resistance at 127.50. 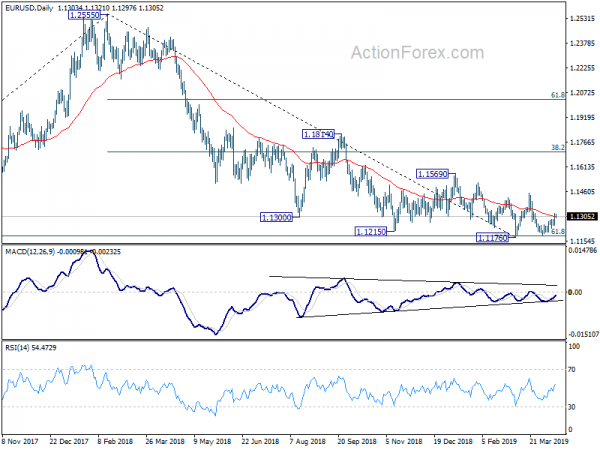 USD/CHF is looking at 1.0040 temporary top and break will resume rebound from 0.9879. GBP/USD, EUR/GBP, GBP/JPY, USD/CAD and EUR/AUD are all bounded in familiar range. In other markets, DOW is down -0.14%. S&P 500 is down -0.11%. NASDAQ is down -0.13%. US 10-year yield is down -0.002 at 2.558, comfortably above 2.5 handle. In Europe, FTSE is down -0.14%. DAX is up 0.11%. CAC is down -0.01%. German 10-year bund yield is up 0.011 at 0.067. Earlier in Asia, Nikkei closed up 1.37%. Hong Kong HSI dropped -0.33%. China Shanghai SSE dropped -0.34%. Singapore Strait Times dropped -0.18%. Japan 10-year JGB yield rose -0.017 to -0.031. US Empire State manufacturing general business conditions index rose 10.1 in April, up from 3.7 and beat expectation of 8. 33% of respondents reported improved conditions, 23% said worsened. New orders index rose 5pts to 7.5. Shipments rose 1pts to 8.6. However, index for future business conditions dropped a massive -17 pts to 12.4, lowest in more than three years. New York Fed noted in the release that growth picked up somewhat but remained fairly subdued. New orders rose slightly, and shipments continued to grow modestly. Delivery times and inventories both increased. Labor market indicators pointed to ongoing employment gains and a small increase in hours worked. The prices paid and prices received indexes moved lower, pointing to a slowing in both input price increases and selling price increases. Indexes assessing the six month outlook suggested that firms were much less optimistic about future business conditions than last month. Also released today, Swiss PPI rose 0.3% mom, dropped -0.2% yoy in March, versus expectation of 0.2% mom, -0.2% yoy. UK Rightmove house prices index rose 1.1% mom in April. According to a Bloomberg report, US is asking China to shift some tariffs away from agricultural goods to other products. And China is in consideration. The request came as Trump didn’t want to lift punitive tariffs on China even when a trade deal is made. Yet, Bloomberg said Trump want to “sell any eventual trade deal as a win for farmers ahead of the 2020 election”. But there was no explanation on why the agricultural industry has this special privilege over others. And there is no indications on which industries are going to take the burden, and why. It’s also noted that the shift could make it easier for China to ramp up its purchases of US agricultural goods as part of the trade deal. But again, there is no details on whether China will cut imports from others countries, and who they will buy less from. At this point, we’ll treat this as a speculation as no one from USTR nor MOFCOM have responded. And we don’t expect them to. An important tricky point regarding SOEs is that it’s tightly interwind with the Chinese government’s industrial policy. That’s deeply rooted in the fundamental nature of China’s system, a “systematic rival” to major economies in the world as seen by EU. While China is making concessions in other areas, it’s an area that the socialist country won’t concede ground. A source said that “if U.S. negotiators define success as changing the way China’s economy operates, that will never happen”. Today, European Council gave the greenback to start formal trade negotiations with the US on two agreements. One is a trade agreement strictly focused on industrial goods, excluding agricultural products. The other is on conformity assessment to make it easier for companies to prove their products meet technical requirements on both sides of the Atlantic. According to a European Commission analysis, the first agreement would increases EU exports to US by 8% and US exports to EU by 9% by 2033. That is, additional gains of €27 billion and €26 billion in EU and U.S. exports respectively. At a news conference, Trade Commissioner Cecilia Malmstrom said “I will reach out as soon as they wake up in the U.S…. and see if can have more clarity on when we can meet to have the first talks on this… We are ready as soon as they are… We are definitely determined to do everything we can to finish this during the Juncker Commission”. That is, Juncker’s term ends on October 31. In the April Monthly Report, Bundesbank said growth picked up only moderately in Q1. Also, the underlying momentum of expansion remained subdued as dragged down by manufacturing downturn. The description of the manufacturing sector are rather dramatic, as orders “literally collapsed” and mode has “significantly deteriorated”. Daily Pivots: (S1) 1.1260; (P) 1.1292; (R1) 1.1331; More…..
EUR/USD’s recovery from 1.1183 is still in progress and intraday bias remains on the upside. Current rise could extend to 1.1448 resistance and above. But in that case, we’d expect strong resistance between 1.1448/1569 to limit upside. On the downside, below 1.1250 minor support will turn bias to the downside. 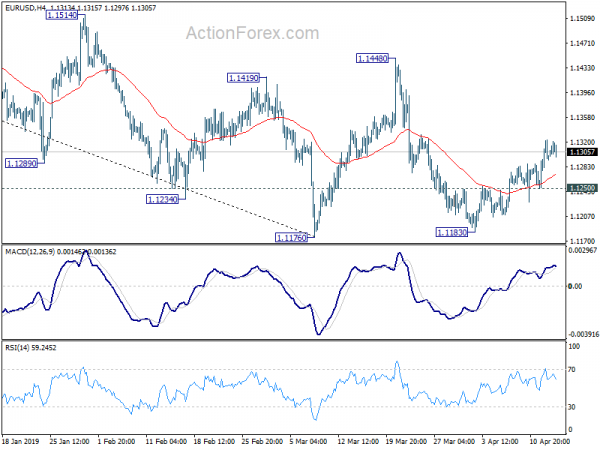 Decisive break of 1.1176 will resume the down trend from 1.2555. In the bigger picture, EUR/USD has been losing downside momentum around 61.8% retracement of 1.0339 (2016 low) to 1.2555 (2018 high) at 1.1186. But for now, there is no clear sign of medium term reversal yet. Downside from 1.2555 is expected to resume sooner or later as long as 1.1569 structural resistance holds. Decisive break of 1.1186. could pave the way back to 1.0339 low.